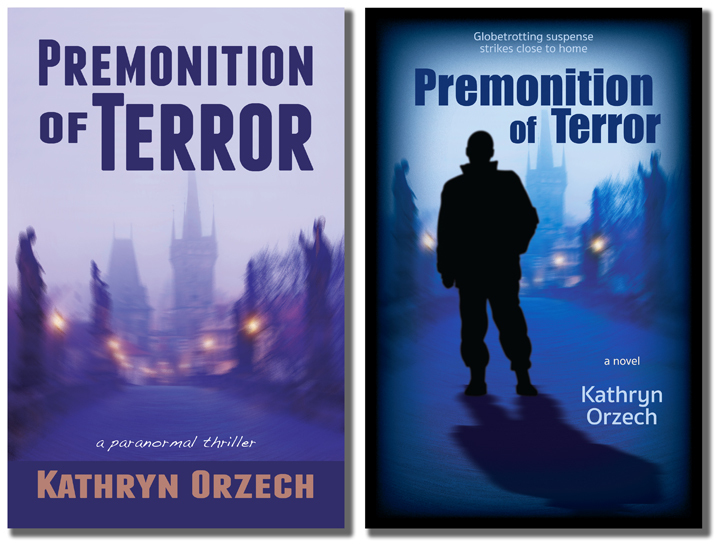 Cover Reveal: Premonition of Terror gets a well-deserved makeover. International threats strike close to home in this psychic thriller when premonitions from around the predict the same catastrophic attack. For book details, visit DreamWatch Press on this website. Premonition of Terror gets the love it deserves. Before and After Makeover Cover Reveal. Cover Reveal: BEFORE (2013) on Left. • AFTER (2018) on Right. I loved this first cover, maybe because Premonition was my first published (though not first written) and it was a rush to hold it in my hands. 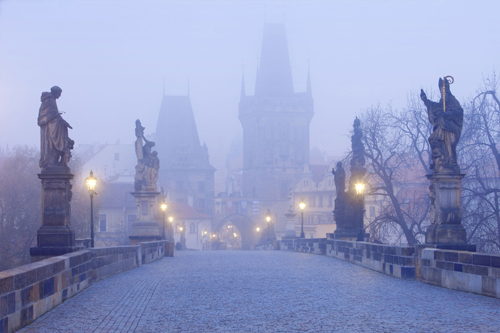 I especially loved the shot of the Charles Bridge in Prague, Czech Republic, photographed by Frank Chmura. His website’s Travel Gallery is stunning. A swirly, circular blur effect in Photoshop expresses the otherworldly mood I wanted, and I shifted the blue tones of the original shot (below) to purple, and made other size and shape adjustments. Charles Bridge, Prague, Czech Republic. Photo by Frank Chmura. I must have read a thousand tips, dos & don’ts, and cover critiques by Joel Friedlander of TheBookDesigner.com. With a graphics background and inspired by the perfect image, I felt confident I could produce a cover, took a chance, risked receiving the brutal truth, and I entered the monthly e-Book Cover Design Awards competition. It’s free. Nothing to lose. 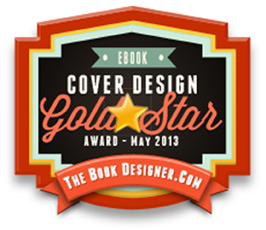 E-Book Cover Design Gold Star, May 2013, awarded to Premonition of Terror. Now I wondered if I should I quit this writing gig and stay with graphic design. Years passed and now and then other authors and friends would artfully criticize the cover design. I listened, considered all comments, but resisted. After all, if Joel Friedlander approved, who was I to disagree. Unfortunate coincidence or authentic premonition? 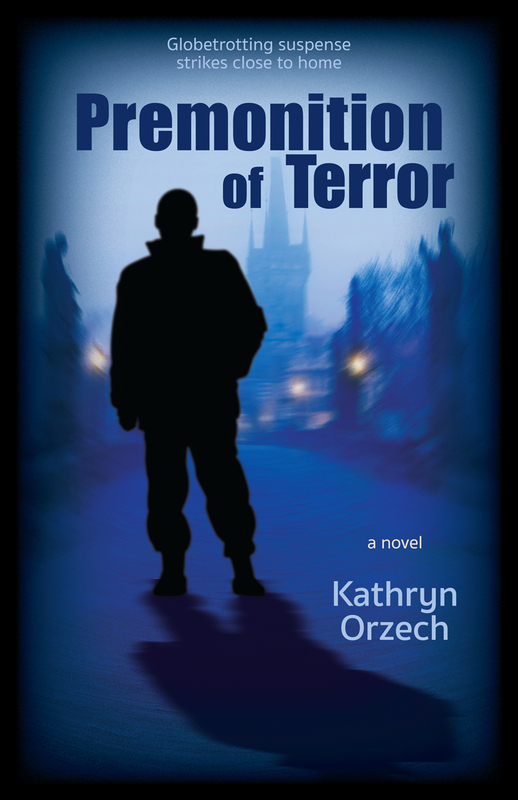 Those who know me or have read the book know why Premonition of Terror never got the love it deserved. With limited distribution and no promotion, it merely existed. To avoid spoilers, I’ll simply say its release date was an unfortunate coincidence to a real life catastrophe—or it was an authentic premonition. I knew the book deserved better. Especially after reading it again. Five years later it remains a fast-paced, thrilling read with characters you can relate to and care about. I missed them, I envied them, and I feel a pull to write a prequel and sequel to fill out a Premonition Trilogy—or more. I resisted change until I realized, what worked five years ago, well, maybe needed a fresh look. So with a few interior tweaks, proofreading in which I am confident (thank you Nancy Breininger), updated front and back matter, and a new cover that tells more story with a human connection, even if you can’t be sure if he’s walking away or coming toward you—even if you can’t know if he’s the danger you’ve been warned about in your dreams. Cover Reveal: Premonition of Terror. I can live with this cover, at least for a while. I look forward to learning how readers react at upcoming signing events—the only vote that matters. International threats strike close to home in this psychic thriller when premonitions from around the predict the same catastrophic attack. How far would you go to stop it if no one believed you? Available in print and e-book where book are sold. Book details and Buy Links on this site at DreamWatch Press. My dad. My hero. My North Star.